As part of the cruciferous vegetable family, brussels sprouts share a close relation to broccoli, kale, cabbage and cauliflower. As far as vegetables go, they're relatively high in protein -- at 3 grams per serving -- and low in calories, at just 38 calories per cup. Brussels sprouts' major health advantages come from their fiber, vitamin and carotenoid content, and consuming them has several beneficial effects on your body. Brussels sprouts come packed with dietary fiber. Each 1-cup serving offers 3.3 grams of fiber -- 13 percent of the daily fiber intake recommended for women and 9 percent for men, according to fiber intake guidelines from the Institute of Medicine. Fiber helps lower the levels of cholesterol in your blood and reduces the risk of several types of cardiovascular disease -- such as coronary heart disease and stroke. It also reduces your risk of a heart attack and protects you from other health conditions, including type-2 diabetes. Brussels sprouts support healthy eyesight because they contain the carotenoids lutein and zeaxanthin, as well as carotenoids that serve as sources of vitamin A. Lutein, zeaxanthin and vitamin A all help support the function of your retinas, the tissues in your eyes rich in nerves that detect color and light. Vitamin A helps your retinas detect color, especially at night, while lutein and zeaxanthin filter light so that your retinas aren't exposed to damaging light rays. A serving of brussels sprouts provides you with 664 international units of vitamin A -- 28 percent of the recommended daily intake for women and 22 percent of the RDI for men, according to the Institute of Medicine. 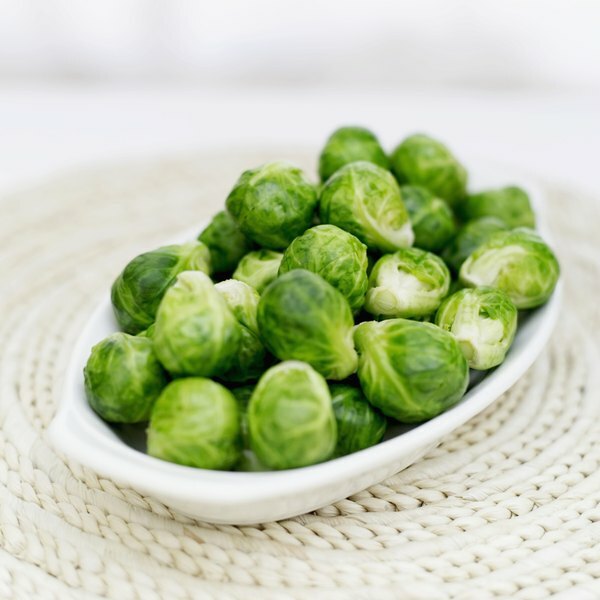 A cup of brussels sprouts also contains 1,399 micrograms of lutein and zeaxanthin, or roughly one-quarter of the 6,000 micrograms you need for heath benefits, according to the Linus Pauling Institute. Brussels spouts' vitamin content also keeps your skeleton strong. It contains vitamin C -- a nutrient you need to make the collagen abundant in bone tissue -- as well as vitamin K, a vitamin that promotes bone mineralization. Low levels of vitamin C weaken your bones, while a low vitamin K intake increases your risk of hip fracture. A cup of brussels sprouts provides you with 156 micrograms of vitamin K -- your entire daily recommended intake, according to the Institute of Medicine. Each serving also provides 76 milligrams of vitamin C. This makes up 84 percent of the RDI for men and the entire RDI for women. Consume brussels sprouts as a healthful side dish -- try roasting them, lightly coated in olive oil, or saute them in a mixture of no-sodium broth and minced garlic. Add flavor to your sprouts by using fresh herbs, such as rosemary or basil. Alternatively, eat the sprouts raw. Simply combine thinly sliced brussels sprouts with chopped kale and a raspberry vinaigrette, or mix chopped brussels sprouts with broccoli florets, chopped cooked sweet potato and a maple vinaigrette.